Listen360 is a customer engagement platform which uses the Net Promoter System to survey your customers for their feedback on their recent interaction with your store. You can then receive real-time alerts on negative feedback, daily response summaries, and access additional reporting on your store’s performance. To learn more, view the Listen360 Overview Video. At the end of every day (11:00 pm in your local time), Ascend automatically uploads information on all transactions which were finished (closed) that day. This includes the customer’s contact information, transaction total, finish date, salesperson, and (for work orders) service technician. Sherpa Tip: Customers with Include in Communications unchecked in their profile are not included in these uploads. 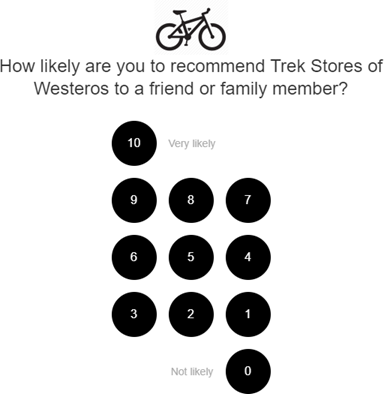 The next morning, customers receive an email with a simple question: “How likely are you to recommend [your store name] to a friend or family member?” The customer then clicks their rating, from 0 (not likely) to 10 (very likely). They’re then taken to a feedback form in their browser. 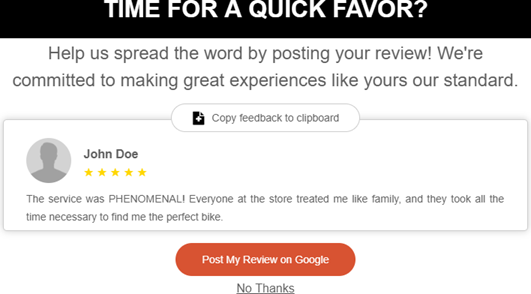 When a promoter shares their feedback, they’re also prompted to review your store on Google (if your location has been confirmed/claimed on Google). If you don’t have a Google presence, they’re prompted to recommend your store to others via Facebook, Twitter, LinkedIn, or email. You’ll automatically receive a daily email summary of your reviews, and your store dashboard allows you to view reviews in real-time. Your dashboard prominently displays negative feedback, along with the customer’s contact information so that you can immediately contact them to make it right – you can also choose to receive immediate alerts (by email and/or SMS) when you receive this feedback. Ensure all of your locations – including any Events, Warehouse, or eCommerce databases – are updated to the June 2018 version of Ascend. Ensure all of your locations remain up-to-date on the most recent version of Ascend. If you’re the store owner, request a login from Ascend support. If you’re a store manager or employee, ask your store owner to set you up with an account. Leave your server computer turned on and logged into Ascend. It’s ok to use the Logout Inactive Desktop option (in fact, we’d encourage it in order to keep your system secure) or to reboot the computer (again, we’d encourage you to do this regularly, as it’ll keep Windows® running smoothly) – just make sure you log in at least once every morning to ensure that all of your scheduled tasks (multi-store data syncing, automatic system backups, scheduled report delivery, etc.) run as expected. Assign a customer to every transaction, and ensure that each customer has complete contact information – you can’t solicit reviews if you don’t know who you’re selling to! Sherpa Tip: Use the Customer Data Capture online report (AOR) to monitor how well your employees are capturing customer information at the time of sale.